When it's a wet and rainy day there is nothing better than snuggling up on the sofa with a nice cuppa (or glass of wine!) and watching some old black and white movies. I remember years ago, that on Bank Holidays they always used to put lots of old movies and musicals on the television - now sadly, it seems to largely just be normal programming, with very few specials on at all. 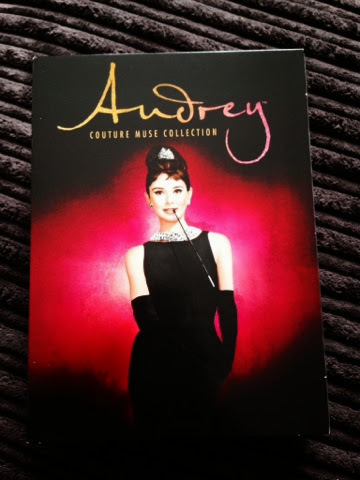 So, that's when the trusted boxsets come in handy and for me, it's all about Audrey! I have always loved that golden age of Hollywood and because my parents did too, my childhood was all about watching movies with Judy Garland, Natalie Wood, Audrey Hepburn, Katharine Hepburn etc. My favourite, although it is hard to choose, is Roman Holiday, closely followed by Sabrina and of course Breakfast At Tiffany's. 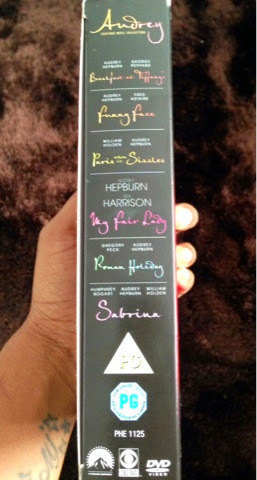 This is a great boxset (below) if you want a good collection of her movies all in one place. I hope you are having a fab bank holiday wherever you are. This is our last one in the UK until Christmas - can you believe it's only around the corner now! Her only Academy Award for Best Actress was for her first film in a starring role - Roman Holiday (She was only elevated to share equal billing with co-star Gregory Peck after his request, as he realised that she had star quality and would be a big star after the movie). The character Holly Golightly in Breakfast At Tiffany's was originally written for Marilyn Monroe. The real name of 'Cat' in Breakfast At Tiffany's was Rhubarb. The designer who created the 'Hepburn look' and Audrey Hepburn's favourite designer was Hubert de Givenchy. The last movie that Audrey Hepburn made was called 'Always' in 1989.